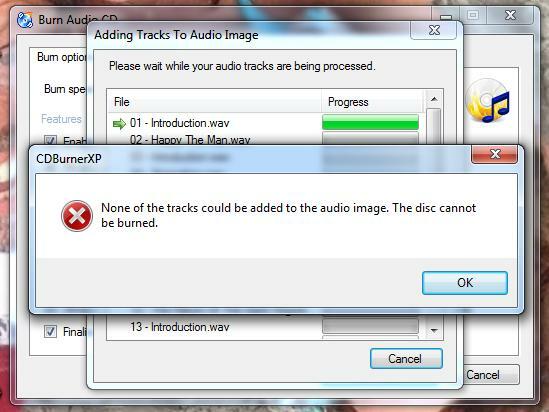 I was burning a .flac to audio cd album when my computer inexplicably crashed. Now when I try to burn another copy I get the error message: "None of the tracks could be added to the audio image. The disc cannot be be burned." I've tried moving and re-naming the files, different brands of cds, re-installing CDBurnerXP and copying the existing disc. But nothing helps, is there a setting somewhere, or an existing file that needs to be changed or deleted? Using the latest version? Is the file actually being processed (progress bar)? Yes it is the latest version, and no the error occurs as soon as the "Adding tracks to audio image" window appears, before any progress occurs. Hrm, do other filetypes work? I am having the same problem, but with a .mp3 file I burned off my goldwave audio software. If I try an mp3 file I get from a commercial source, there is no problem, but when I try to do my audio I get the same error. Is there some sort of setting I specifically need when creating an mp3 in order for your software to burn it? My files are: MPEG Audio Layer-3, 44100Hz, 128 Kbps, mono files and they don't work on your software. Yet I burn a commercial file: MPEG Layer 3, 44100Hz, 64kbps, mono and it works. I changed my file to emulate the commercial file, and it still didn't burn. Ideas??? Maybe you are adding DRM protected? If so, it certainly won't work. Otherwise, send me the file, and I'll have a look at it. And the files are not possibly corrupted? Did you try playing them? Currently, I don't have an idea what could have happened otherwise. I receive the same error message. Impossible to burn any audio cd. Checked your site, found the wma-tool and the portable version. Unzipped portable version. Compilation worked nicely. After hitting "burn" I received a window with 2 options: "2 seconds pause" and "advanced options". Hitting "Advanced" immediately opened a progress window. First track progresses to the end, then above error message pops up. Nothing on CD. No matter which track is first, if mp3 or wma (haven't tried others). All files can be played. Some of them I have burned before with different burners. When I click "2 seconds between tracks", burning works. In "Advanced settings" the "disc-at-once"-option ist not clickable, radio button is visible but inactive. I can live with the "2 seconds", but these flaws are not what I hoped for when I read all the high praisals for CDBurnerXP in PCmagazines. The same symptoms wth the latest istallation version. If DAO is disabled, it's not supported by your burning device. However, it shouldn't make a difference whether or not you say "2 seconds gap" or "advanced settings", because at this point CDBurnerXP doesn't actually care about it then. Also, you should make sure to use the latest version, there have been some changes to this part of the program. If it helps anyone, I got the same error, but it was because I was attempting to burn the files after having moved them. Perhaps you're burning the disc from a pre-saved image that refers to the wrong locations for the tracks? Yay I'm so glad you wrote this! I was completely confused on what was going wrong. But I did move all the files to another folder so they would be "easier" to burn That turned into a headache haha. If I use a different software burner (such as burnaware) it works so I suppose it's something with the latest version of cdburnerxp or a recent update of my windows 7. I've already tried to disinstall the software and reinstall it after shutting down the PC but I always get the same error!